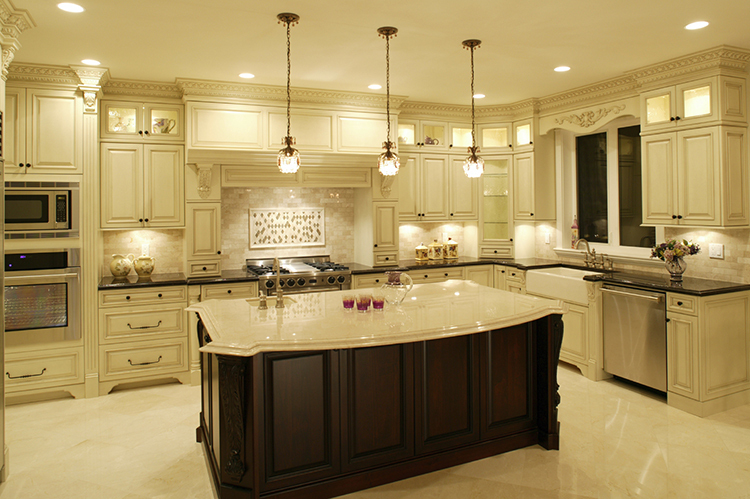 Luxury Kitchens are enhanced with proper lighting. 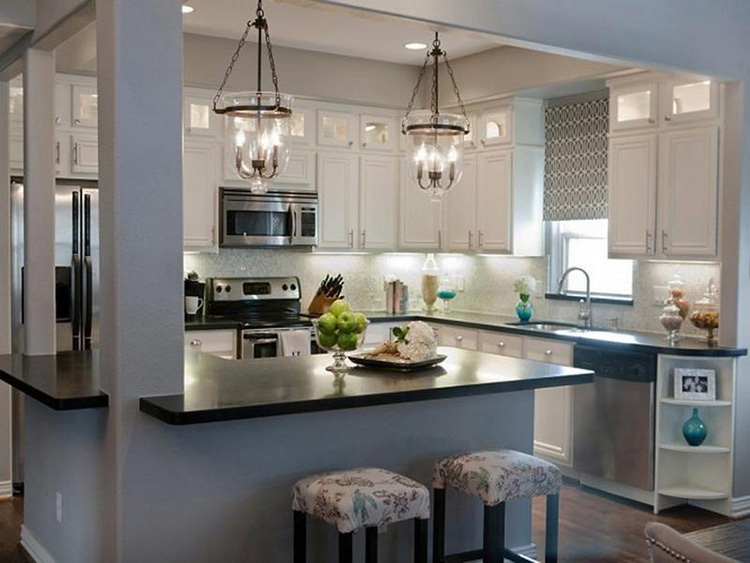 These kitchen lighting ideas will transform a kitchen from drab to electrifying. 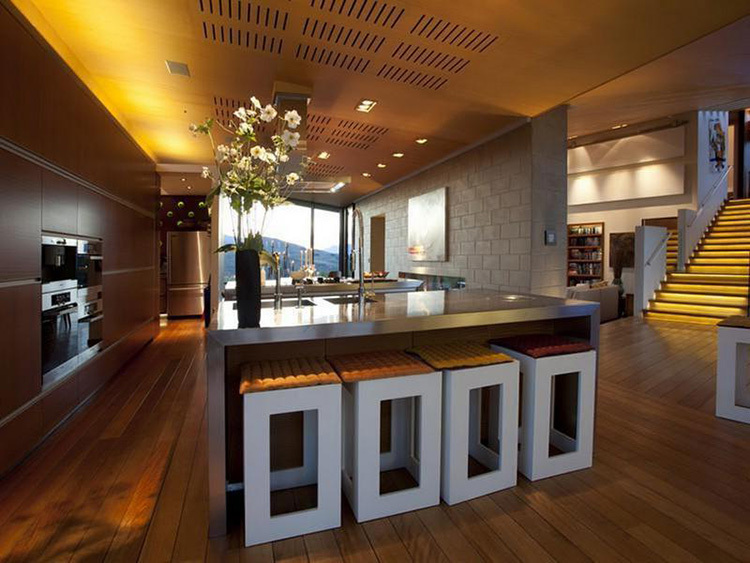 There are several categories of kitchen lighting that should be considered when designing a luxury kitchen. Recessed ceiling lights are simple and elegant. The recessed ceiling lights can be arranged in just about any pattern.. Just be careful to distribute these ceiling lights evenly so that the whole kitchen receives equal lighting. Non-recessed ceiling lights are a less modern choice, but can be elegant for traditional kitchens. 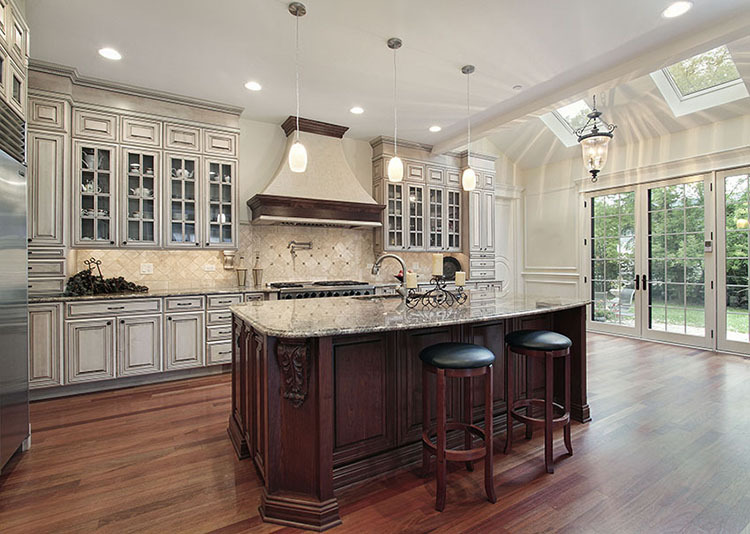 Chandeliers are a popular choice for kitchens. Because they tend to dominate the open space, a chandelier’s style sets the tone for a room’s décor more than any other lighting fixture. Under Cabinet Lights are now the norm for many kitchens. The extra light makes working on the counters easier. These lights also are great accent lights when no work is being done. 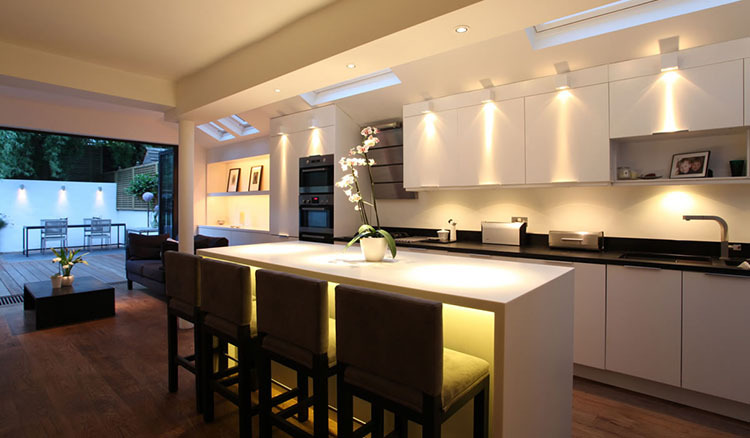 Accent lighting can be effectively used into luxury kitchens to highlight certain aspects of the kitchen. 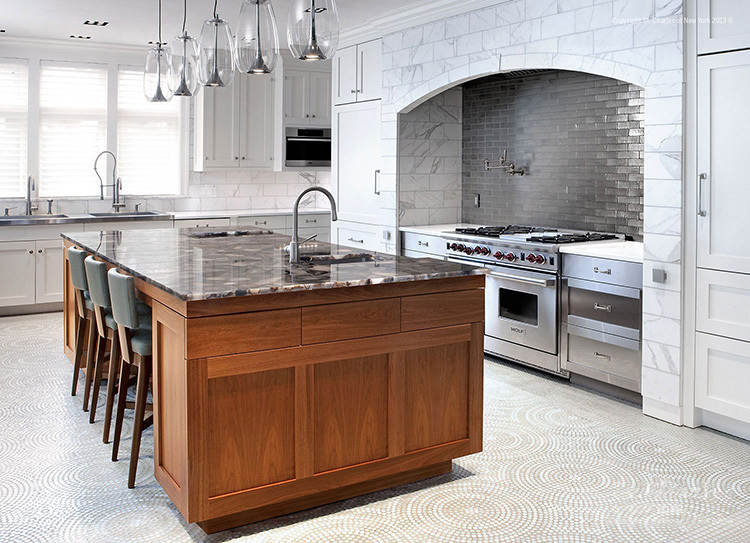 This kitchen is lit with recessed lighting that is arranged in an asymmetrical pattern on the kitchen ceiling. There are plenty of recessed lights to evenly light the entire kitchen. Under cabinet lights are used to brighten the counter work space. Two pendant lights highligth the island eating area while ceiling lights above are shaded for an element of style and to create a soft ambient light throughout the kitchen. Notice the accent lighting in the cabinets above the sink. 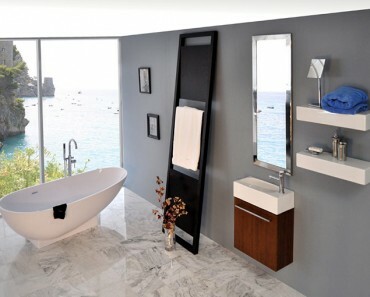 The frosted glass of the cabinet doors diffuse the light into the room. This is a unique and stylish kitchen lighting idea. A simple chandelier hans above the modest table in the center of this kitchen. 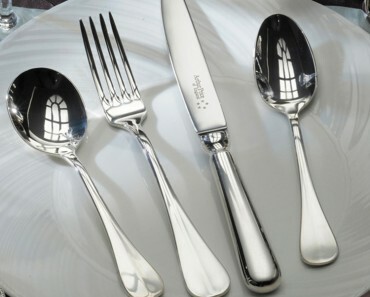 Combined with the lamp on the counter there is adequate lighting for daytime meals. When the sun goes down this same lighting sets the scene for a romantic low-light dinner between husband and wife. Four square pendant lights hang below to illuminate the island eating area. The recessed lighting above makes the kitchen bright when food is being prepared. 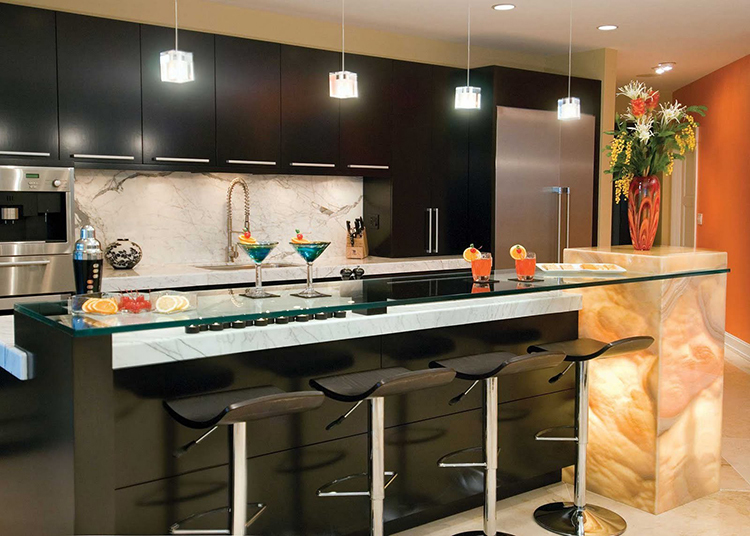 A dimming switch changes the kitchen to a cool and romantic bar when it is time to server the martinis. 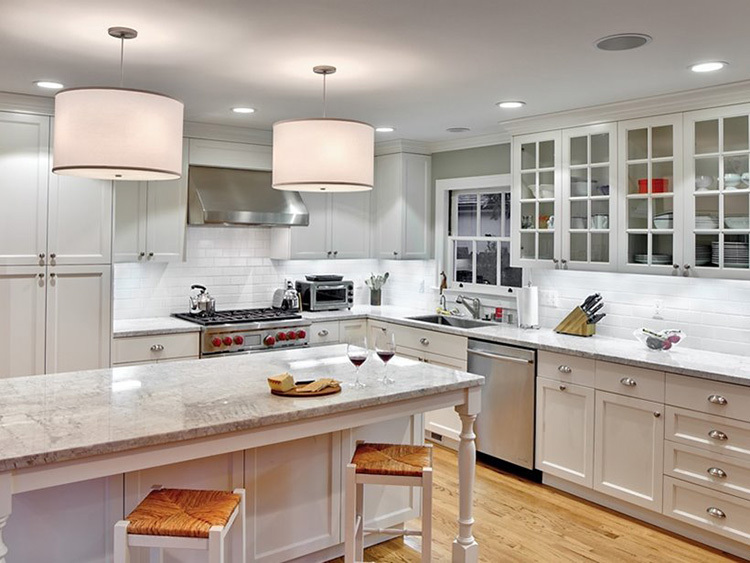 Dimmer switches are great kitchen lighting ideas to transform the mood of the room. 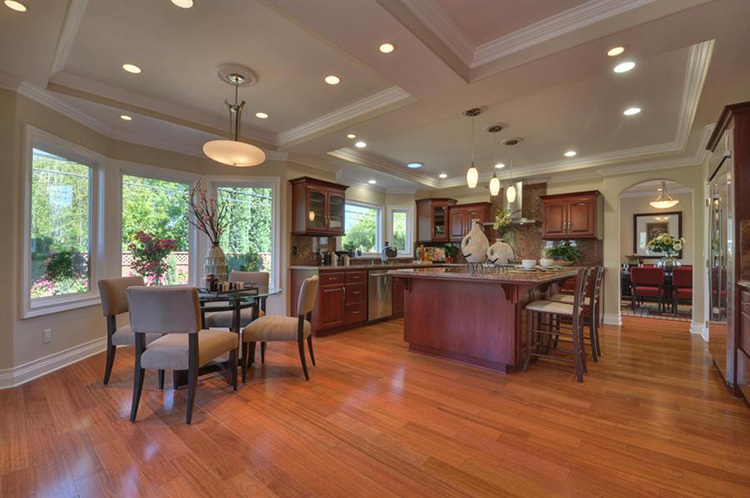 This large brightly lit kitchen uses 5 pendent lights to highlight the island eating area. 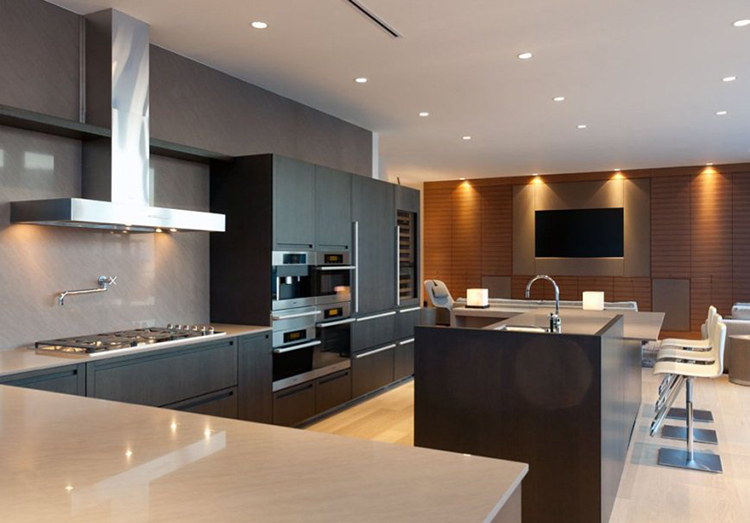 There are a plethora of small recessed lights to ensure even lighting throughout this luxury kitchen. A round chandelier hangs above the table with additional pendant lights that almost act as a separation between the kitchen and the dining area. 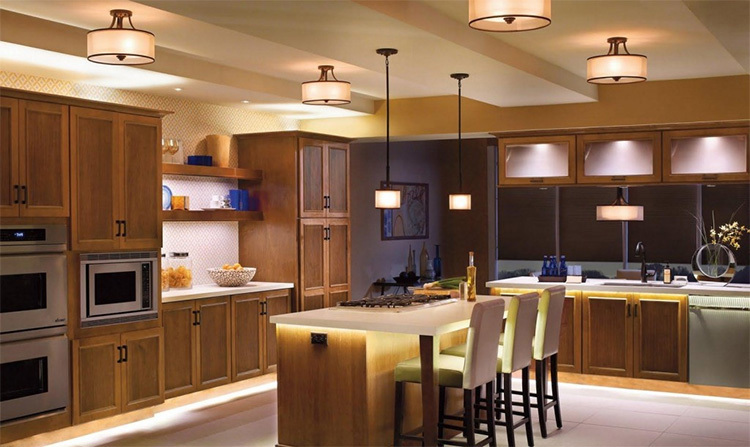 Using low hanging pendant lights to separate parts of a room is a unique kitchen lighting idea. Recessed lighting in a wood plank ceiling is an unusual kitchen lighting idea but it works well in this rustic but modern kitchen. Two blue shaded pendant lights over the sink area match the scene outside the windows that stretch to from the counter to the ceiling. The pedals of this flower chandelier steal the show in this kitchen. 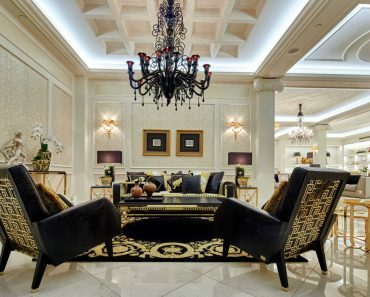 The lighting is accented by the recessed ceiling lights with brass fixtures. 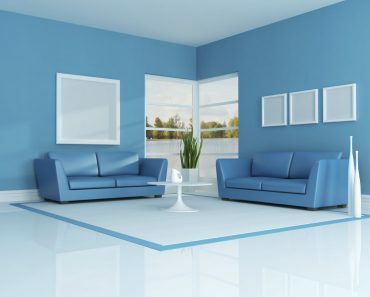 The refrigerator units below the shelving on the are lit up by blue lights that add to the ambience of the room. 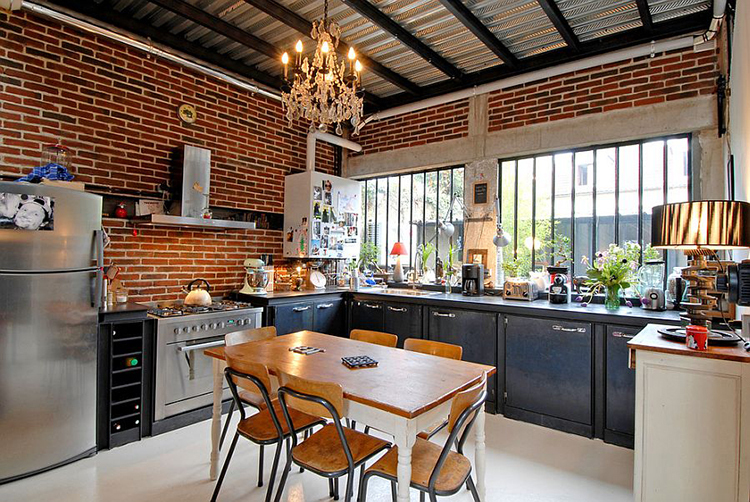 Old fashioned pendant lights are the main source of lamination in this modern kitchen. The metal finish these lights reminds us of car lights in the early 1950s. The recessed lighting above rounds out the lighting in the room and stays with the modern theme of this spacious urban kitchen. 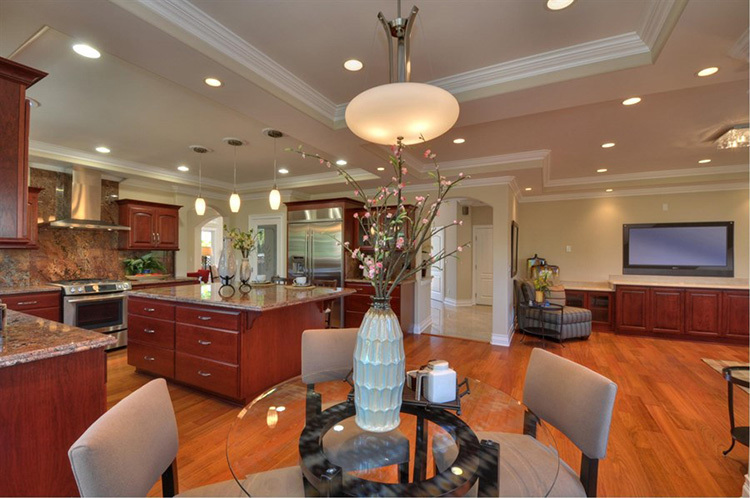 Bright recessed lights are practical in this spacious luxury kitchen and dining area. The oblong pendant lights above the granite island create the perfect area for the kids to do their homework before bed. The hanging ceiling light above the dining table looks great with then natural light coming from the lush outdoors. The sunlights and glass doors in this kitchen pull in plenty of natural light. 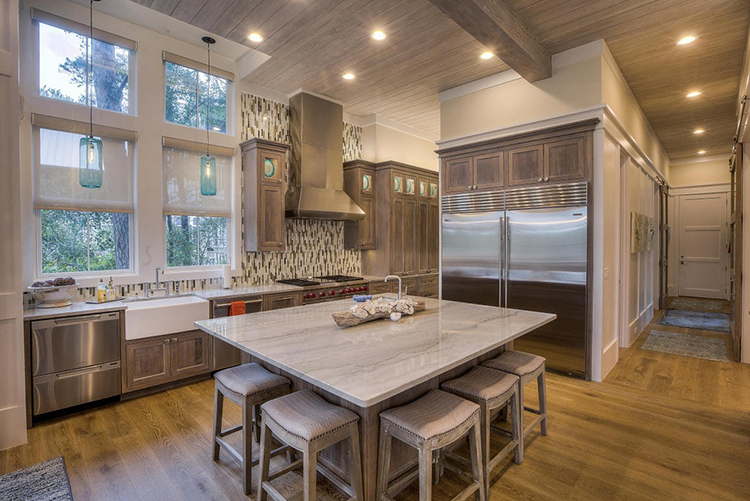 The 3 pendant lights above the island and the recessed ceiling lights ensure that the lighting is adequate for evening meal preperation or entertaining in the kitchen. 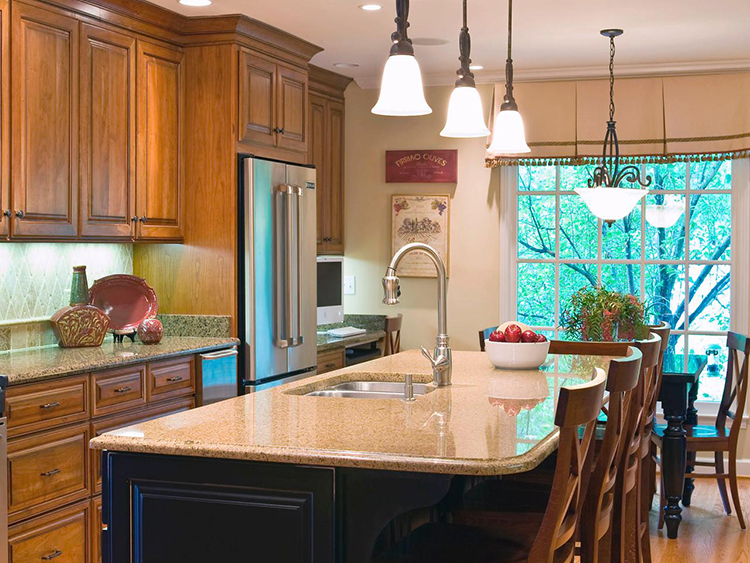 This classic kitchen uses pendant lighting and under cabinet lighting to create a bright workspace and dining area. The accent lighting on the rear wall is a cool kitchen lighting idea. These lights create triangle shapes on the brown wall for a distinctive look. Small recessed lights evenly spaced on the ceiling work to ensure that there is even and available light throughout this modern kitchen. When considering kitchen lighting ideas, it is often good to think both big and small. The large hanging ceiling lights are a focal point of this modern kitchen design while the very small recessed lights create a stark contrast compared to the oversized hanging lights. 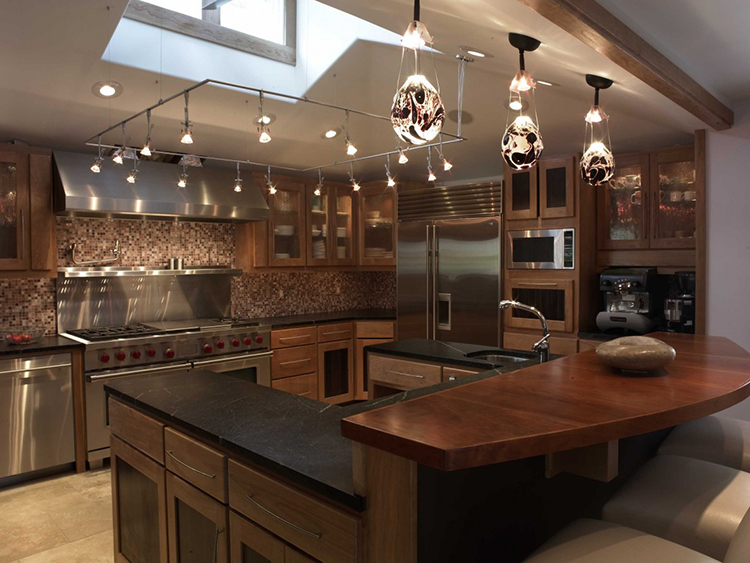 This compact kitchen uses candle style chandeliers along with plenty of under cabinet lighting. The effect is a bright kitchen with suitable working area for food preparation. Despite the small size of this kitchen the lighting and layout make it a quite comfortable and practical. Consider unique accent lighting when considering kitchen lighting ideas. 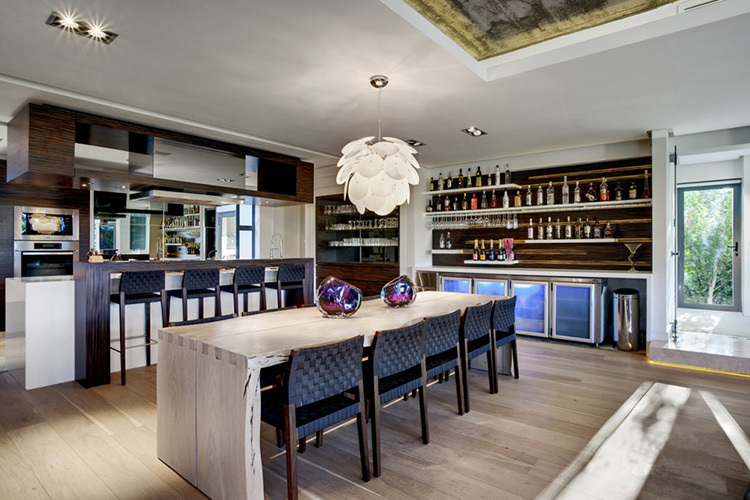 Under table lighting and cabinet accent lighting contribute to the modern look of this open kitchen space. Small skylights also create a unique look above the cabinetry. Classy and classic, this kitchen ligting design incorporates under cabinet lighting, recessed ceiling lights and pendant lights to create a very bright food preparation space. 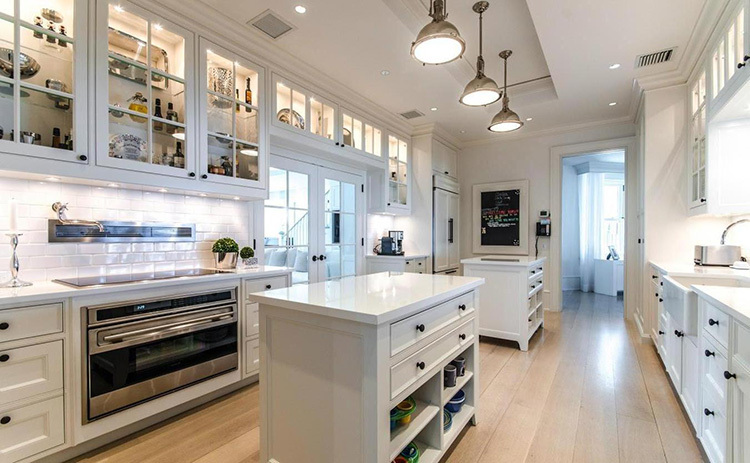 The upper cabinets with glass doors stand out because of the lights installed inside. This is another interesting kitchen lighting idea. The dark wood and back plash colors in this kitchen appear to absorb the light – making the need for bright lighting imperative in this kitchen. 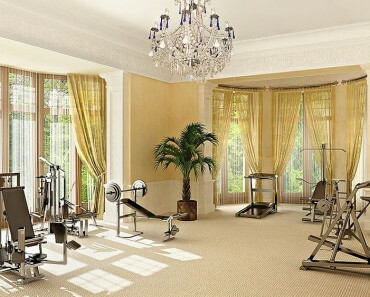 Twenty track lights, plenty of recessed lights, and interestingly shaped hanging ceiling lights do the job. 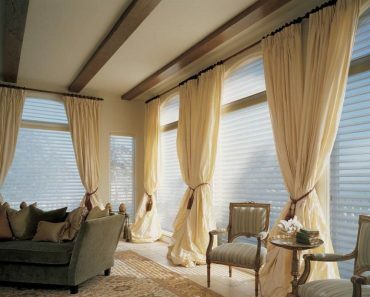 The skylight in the ceiling also helps to make this space warm and inviting. 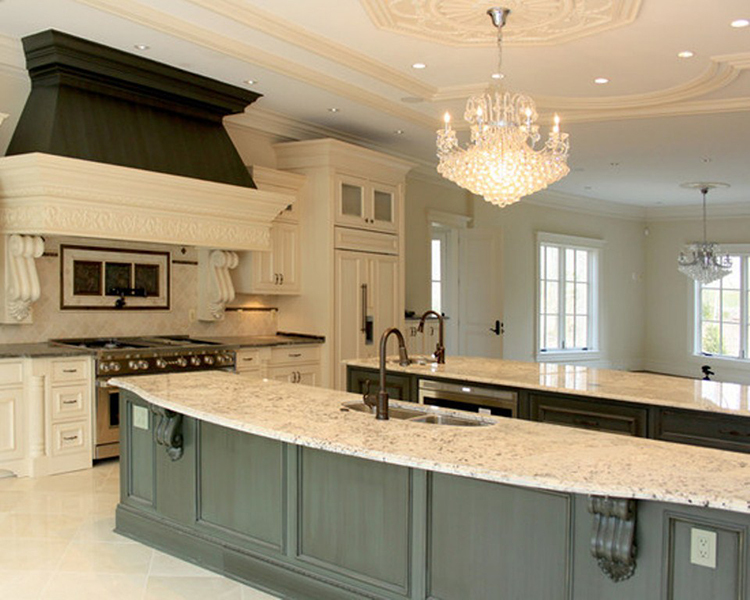 A single classic chandelier is the strongest design element of this classic kitchen design. The extra small recessed lights in the ceiling ensure that the room is bright without taking away from the Victorian charm of the design. When considering kitchen lighting ideas be sure not to over do it. The pendant lights, hanging ceiling light, and plethora of recessed lights create a nice bright room. But too many lights makes the room look a bit chaotic. Limiting the number of lights will allow the cherry red cabinets and hardwood floors to be the focal point of the kitchen and would make the room much more inviting. The use of simple colors on these pendant lights creates an extremely stylish statement. When considering colors for your kitchen lighting ideas you need to be careful. In this example the colors wonderfully accent the kitchen and will also be complimentary to many types of colorful foods that will no doubt be served. The large round hanging ceiling lights are not necessary or desirable in this kitchen’s lighting design. 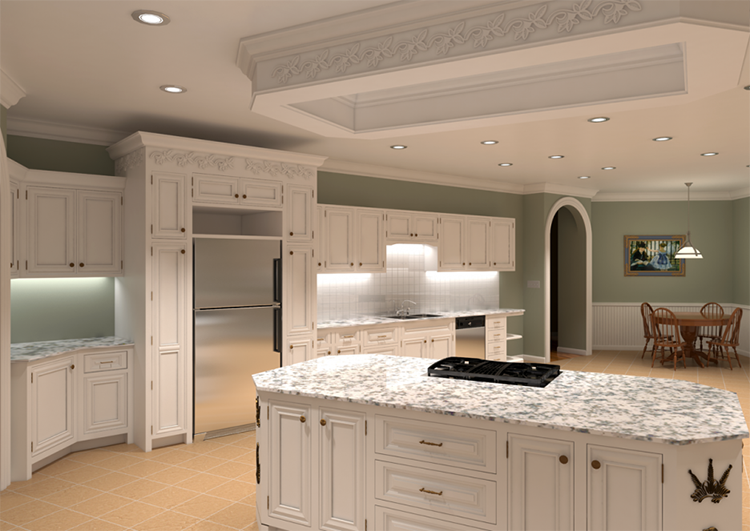 The look of the kitchen would be much cleaner with the addition of some extra recessed lights to ensure that the island eating space is lighted properly. When considering your kitchen lighting ideas, once again, please be sure not to over do it. Often times less is more. This modern kitchen is all about accent lighting. The accent lights highlight the uniquely slanted ceiling but leave the kitchen a bit dark. The large glass windows in the rear of the room help to compensate for the low lighting levels in the kitchen. 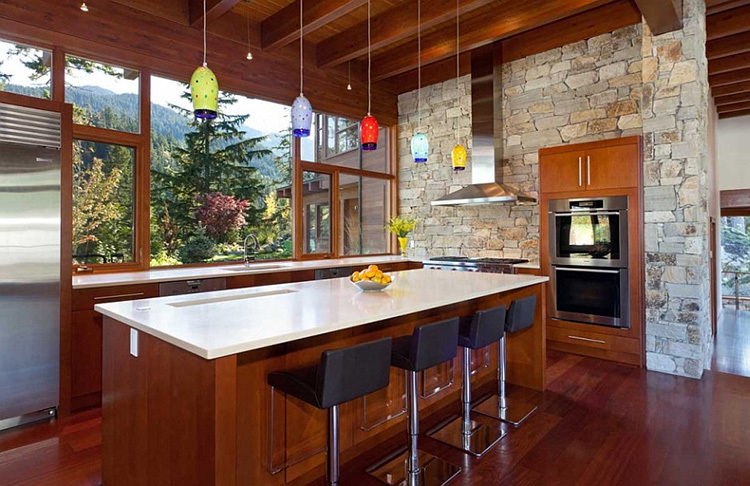 In this kitchen the use of large hanging pendant lights with clear glass coverings creates a simple lighting design. The stove and counter area has additional lighting to for the task area. We like this kitchen lighting design because it is simple and classy. 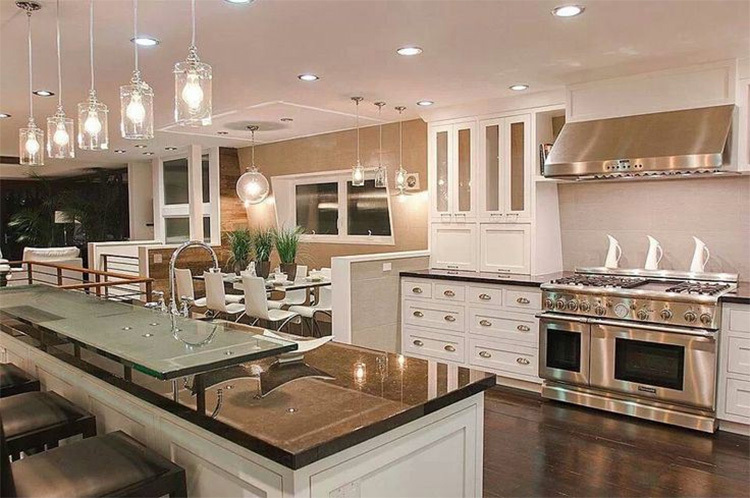 The lighting is not the focal point of the kitchen design and you almost don’t notice this classy lighting.